Lots of Qassams exploding – in Gaza. UNRWA school hit. The Gaza NGO Safety Office keeps track of rockets fired from Gaza in their SMS messages – and also the rockets that fall short, since they are concerned with keeping their NGO members safe. 12/28 9:00 Pal. ops. fired 4 HMRs [“home-made rockets” – EoZ] from Gaza Strip, 3 of them exploded prematurely. 12/29 9:00 Pal. ops. fired 5 HMRs from Gaza Strip, 1 of them dropped short and fell on a Pal. house causing 1 injury. Over the course of three evenings, Pal. ops fired 8 HMRs (1 of which dropped short) towards Israeli territory. Most of the HMRs were fired from around the Al Bureij area. During the same reporting period, Palestinian operatives fired 1 Grad, 4 HMRs, and 3 mortars [from Gaza City.] Of the HMRs, 1 exploded prematurely and 1 dropped short, striking and severely damaging a Palestinian home in Zaitoun area. 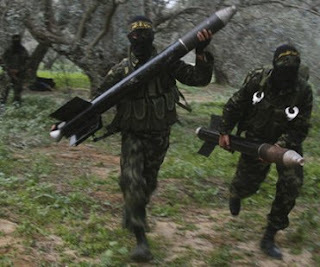 [In North Gaza] a total of 18 HMRs, and significantly, 4 Grad-style rockets were fired towards Israeli territory. Of these, one third of the HMRs (8) either dropped short or exploded prematurely before leaving Palestinian territory. While no damage was recorded in Israeli territory as a result of the rocket fire, Palestinian property was damaged one three separate occasions: on the first, an UNRWA girls school was struck with a rocket, piercing the roof (it is also worthwhile noting that that the rocket was launched at 1420hrs in the afternoon, though on a Friday); in the second, the boundary wall of a property in Beit Hanoun was struck causing minor damage; in the final case, a building in Beit Lahiya was hit, injuring 2 Palestinian civilians. You mean you didn’t hear about the UNRWA school being hit by a Palestinian Arab rocket? Or the injuries that Gazans have had, or about their property damage? You missed the angry condemnations by UNRWA officials? Or by Palestinian Arab “human rights” groups? You missed the story this morning about a Gazan being injured by a Qassam rocket? By the way, we missed the third anniversary of the first people killed in Operation Oil Stain – two Gazan girls, killed by a Qassam rocket, December 26, 2008. Muslim Brotherhood militants flying to Greece to join flotilla?